WRF files aren’t exactly CF compliant: you’ll need a special parser for the timestamp, the coordinate names are a bit exotic and do not correspond to the dimension names, they contain so-called staggered variables (and their correponding coordinates), etc. Note that some dimensions / coordinates have been renamed, new variables have been defined, and the staggered dimensions have disappeared. This computation is done only on demand (just like a normal NetCDF variable), this new layer is therefore relatively cheap. In addition to unstaggering, Salem adds a number of “diagnostic” variables to the dataset. Some are convenient (like T2C, temperature in Celsius instead of Kelvins), but others are more complex (e.g. 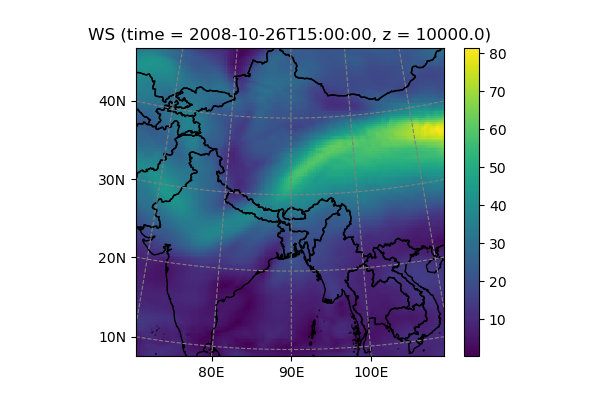 SLP for sea-level pressure, or PRCP which computes step-wize total precipitation out of the accumulated fields). For a list of diagnostic variables (and TODOs! ), refer to GH18. Note that currently, the interpolation is quite slow, see GH25. It’s probably wise to do it on single time slices or aggregated data, rather than huge data cubes. It is possible to open multiple WRF files at different time steps with open_mf_wrf_dataset(), which works like xarray’s open_mfdataset . The only drawback of having multiple WRF time slices is that “de-accumulated” variables such as PRCP won’t be available. For this purpose, you might want to use the deacc() method. Salem provides a small tool which comes handy when defining new WRF domains. It parses the WPS configuration file (namelist.wps) and generates the grids and maps corresponding to each domain.